Its hard believe that I’m already nine weeks into my half marathon training and that this week I’ll hit the halfway point of my 19 week training plan! Like the past couple of weeks, life has been especially busy, particularly since this past week was the last week of the first quarter at school. This was very evident in my classroom, as I had students stay after school with me nearly everyday this past week, working on getting caught up and bringing their grades up as much as they could. To top off a busy week, I proctored the SAT at school Saturday morning. The week as far as training was concerned didn’t start off the way I had hoped. After last week’s new PDR (personal distance record), I knew that my mileage would take a slight decrease this week, but that didn’t mean that I didn’t still have high expectations for my training this week. Throughout the day at work on Monday, my right ankle was bothering me (the same one that I’ve had ongoing problems with since I was younger), and although I had planned to complete a run that evening, I opted instead to rest and elevate it. Fortunately, Tuesday evening I wasn’t in pain anymore, but I scaled back the speed and distance of my run in favor of not overdoing it. When I got home Saturday afternoon from proctoring the SAT, my plan had been to complete my long run. Unfortunately, an upset stomach caused me to push my long run back a day, but thankfully I still got it in this week. Although this didn’t seem to be my week in terms of completing runs when I planned to, I’m thankful that I still got all three in, as well as a training walk. During week 10 I should reach another new PDR – this time 8 miles! What a way to celebrate the end of my second full month of training! 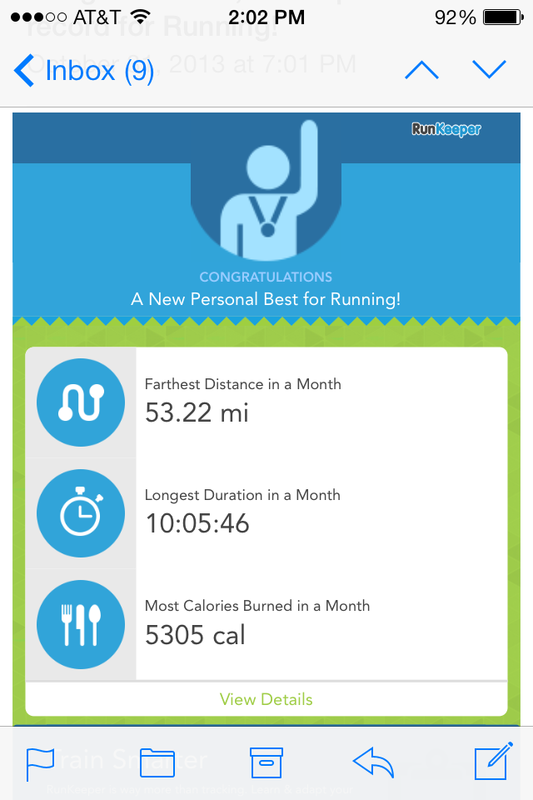 53.22 miles of running in one month – way more than I ever dreamed I could run in a month, or maybe a year, prior to my starting to run back in March. QOTD: How do you adjust your training when your body tells you not to do something? This entry was posted in Milestones, Training, WDW Half Marathon Training and tagged Disney World Half Marathon, half marathon, half marathon training, half marathon training plan, milestone, resistance band, RunKeeper, running, training, training plan, treadmill, walking, weekly recap, weight training. Bookmark the permalink.